Following a week-long visit to Beijing in August by Richard Duncan and Leslie Young from the Center for Universal Design, NC State University signed a five-year exchange agreement with the Beijing Institute of Technology (BIT) in October. 3) BIT and the College will exchange students and faculty. Work has already begun on publications selection, while development of a universal design course and discussions of student and faculty exchanges will commence in 2007. Pictured here in the main lecture hall at the conference center are many of the key international speakers at the 06' Beijing International Symposium on Universal Design. 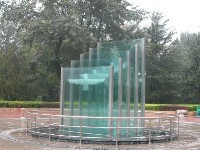 The central fountain on BIT's campus, displaying the logo for the University. The athletic facilities at BIT. 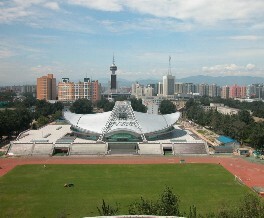 Featured here is the main indoor arena, to be used at the 2008 Beijing Olympic Games.